Posted May 31, 2009 under Ask the Mediatrician. Q: Last week, my 2-year-old daughter watched the Disney movie The Jungle Book. She hasn’t stopped talking about how scary the characters were and how she’s having bad dreams about them, but she keeps asking the watch the movie. We decided to put the movie away until she’s a little older. Did we make the right decision? How can we address this subject with her as we move forward? How can I keep my teens safe on the Internet? Posted May 30, 2009 under Ask the Mediatrician. Q: My teenage children seem to spend all their free time on the Internet, using Facebook, IMing their friends, and watching YouTube videos. How can I make sure that what they are doing is safe? Posted May 29, 2009 under Ask the Mediatrician. Q: My 11-year-old daughter keeps begging me for her own cell phone. She claims “all her friends have them”, and I admit, it seems most of them do. Should I get her one? Q: The television is a constant source of conflict in our house. I am always battling with my 2nd and 5th grade kids about how much TV they watch, but I’m not even sure what a good limit would be. How much TV is too much TV? How can we set good examples of media use for our kids? Posted May 28, 2009 under Ask the Mediatrician. Q: My child is still an infant, so he isn’t using much media yet. But I am realizing that my husband and I are constantly “connected”! Our laptops, cell phones, and iPods are always on, mostly for work reasons. How should we limit our own media use to set the best example for our children? Should I worry about the violent video games my son plays? Posted May 20, 2009 under Ask the Mediatrician. Q: My 10 year old son loves to play video games. The other day I happened to see a few minutes of one of the games he was playing and it was much more violent than I thought it would be. Should I worry about how these games affect him? Will baby videos help an infant learn? Posted May 19, 2009 under Ask the Mediatrician. Q: I just became an aunt for the first time and while looking for baby gifts, I keep coming across educational DVDs for infants. Will these help my nephew get a head start on learning? Posted May 11, 2009 under Ask the Mediatrician. 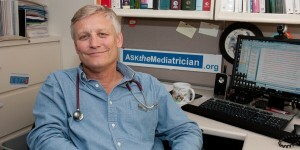 Dr. Michael Rich, The Mediatrician® answers your questions about media and kids’ health. Posted May 7, 2009 under Ask the Mediatrician.